The Justice Department has not developed a coordinated plan to combat ID theft, the report says. 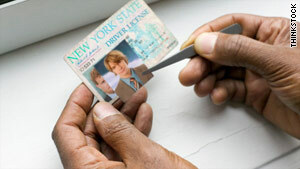 Washington (CNN) -- Ten million Americans a year are victims of identity theft. It's a growing problem in the United States, but fighting it doesn't appear to be a priority, a new report says. The report says "the specific crime of identity theft is not a top FBI priority." However, the report adds that the FBI often addresses the issue through the Cyber Division's criminal intrusion program, which is a priority of the agency. Similarly, ID theft investigations are often part of larger federal criminal investigations into health care fraud, mortgage fraud and credit card fraud. "Identity theft can also be a significant element of violent crimes, such as domestic abuse, and even terrorism, and a significant number of ID theft-related crimes originate overseas," the report said.